Play Shogun of Time Slot Online with 500 Free Spins! Shogun of Time is a UK Online Slot Game by Just For The Win. This 4-reels, 81-betways game has an RTP of 96.02%. 3 Free Spins symbols award 8 Free Spins and 4 Free Spin symbols award 16 Free Spins. In Shogun Of Time online slot game, the traditions of Japan get a futuristic makeover where many chances to win real money can be found in the digital dojo. Set in a futuristic Tokyo, Shogun Of Time slot game places you in a computerized, high-tech high rise apartment. Through the transparent reels appears a large window overlooking other high rises in the city and there is also what looks to be a magical ‘re-spin’ portal in the middle and 2 cylinders of an orchid plant on either side. The background is darkish purple and blue, with bright neon colours illuminating the reels and symbols. High to medium value symbols include a logo, a Shogun samurai mask, female Samurai armor, a fan, and lucky coins. There is also a Wild and Free Spins orchids. Of lower value are standard playing cards A, K, Q, J, and 10. Visually, the dazzling neon of Shogun Of Time online combined with the flashing lights and digital quality immerse you into an environment resembling Tron or Blade Runner. There are also creative and exciting animations, especially when a feature is launched and you feel the entire reels become energized. The light and soothing background music nicely blends futuristic sounds with classic Japanese tunes, and this contrast beautifully with the more loud and electric sound effects upon wins. Shogun Of Time online is a great slot to enjoy when you would like to relax, yet still feel an excitement and thrill of being immersed into another world. Teleport to Rose Slots as there are many amazing chances of generous payouts to downloaded with each spin of the reels. Letting you train with the Cyber Samurai of the future in Shogun Of Time slot is one of the best online casino games designers, Just For The Win Studios. Just For The Win is a premium game studio developer based out of Sweden that has consistently showcased titles that offer incredible and immersive graphics and animations, a simple and engaging style of gameplay, and Bonus features that always excite given the many chances for generous wins. Players of online casino UK can discover a wide-variety of other Just For The Win creations at RoseSlots.com such as ‘Reel Talent’, ‘Temple of Tut’, ‘Amazing Aztecs slot’, ‘Rainbrew’, and ‘Deco Diamonds slot game’. Do not worry is you are not a martial arts master as Shogun Of Time online slot has a gameplay that is easy to understand, immersive, and exciting. With 4 reels (and a feature 5th reel), 3 wager rows, and 81 to 243 ways to win, you may be named the top Samurai of the future. The Wild, who is a pretty Samurai girl from the future, will slash away with her sword all other symbols except the Free Spins Bonus. The Wild can also appear fully stacked on the reels and become 3 locked spaces for greater winning potential. The logo represents the highest paying symbol with 5 on the reels awarding an exciting 12x multiplier on your initial bet. The Shogun Samurai mask follows this with 5 on the reels granting you an 8x multiplier payout. The Reel Split Re-Spin feature can also occur during the main game whenever there is a win of 4 successive symbols. This causes the portal in the centre of the slot to open, between reels 2 and 3, for a free re-spin. You then get to enjoy a full 5 reels in play with an increase from 81 to 243 paylines, and all the other reels will remain locked in place for the spin. The gameplay itself is very enjoyable and calming, and the middle 5th reel occasionally teases that it is about to be activated. Betting in Shogun Of Time online slot has a flexible range from 10p to £100. There is also a convenient Quick Spin feature for faster, Samurai speed style of gameplay. If you are practicing you Cyber Samurai moves in the dojo, simply set the AutoPlay for 5 to 100 continuous spins. 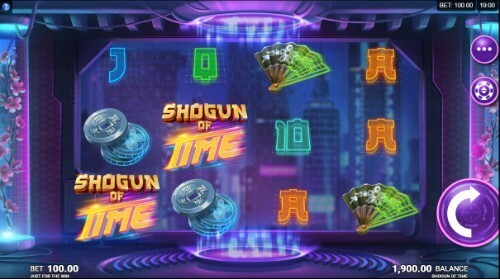 It is always fun to escape to the future, especially in the vibrant cyber city of Tokyo, and Shogun Of Time online lets you do this any time and anywhere as it is nicely formatted and designed as a mobile slot as well as on other devices like desktop and tablet. The future can literally be in the palm of your hands. With a generous bonus round and a main game that offers an exciting split reel feature, the theoretical RTP or return to player is estimated at 96.02%. This is classified as a medium variance slot, which strikes a relatively good balance for return on your wager. Of course, travelling all the way to the future to train with Cyber Samurai must have its perks and Shogun Of Time slot does not disappoint. There is up to a 2,700x multiplier jackpot on offer for transcending through time and space. 3 or 4 Free Spins pink Orchid symbols on the reels will trigger the Bonus Round with 8 or 16 Free Spins respectively. Even more exciting is the fact that the Reel split feature of the main game is activated throughout the Free Spins with a full 5 reels in play and 243 ways to win. With 16 Free Spins at a high wager and all 5 reels and paylines active, it is safe to say that you could soon be upgrading to high quality chopsticks for eating gourmet sushi. Further, during the Free Spins, this extra middle reel appears as a stacked Wild of the generous Cyber Samurai girl. This substantially increases your chances of forming winning combinations as the Wild Samurai helps form many winning combinations, especially that it is locked in the middle, and therefore can combine the symbols from the left or right into greater payouts. For instance, only 2 identical symbols need appear in the 6 spaces of the 2 reels on either side to create a winning 3 combinations. And with up to 16 Free Spins to be won, there is a greater chance of payouts in this scenario.